As many of you know, the Asterisk® 13.16 and 13.17 releases caused serious breakage with FreePBX® 12 GPL deployments. These have been resolved in the new Asterisk 13.18 release candidate, but it prompted us to do a little exploring for alternatives while many of you were partying at AstriCon in Orlando last week. 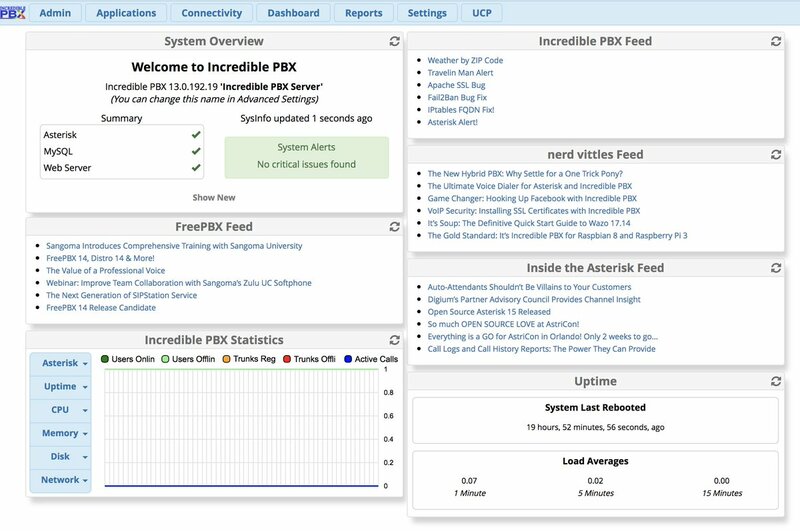 To give credit where credit is due, the Sangoma developers have made some impressive improvements with their FreePBX 13 release. And now we’re pleased to introduce a preview of the new Incredible PBX 13-13 platform featuring almost all of the FreePBX 13 GPL modules. For those that prefer lean and mean implementations of Asterisk, this preview edition is for you. You get the latest version of Asterisk compiled from source, and you get a base install of the FreePBX 13 GPL modules. The only preconfigured component in the build is the Travelin’ Man 3 firewall which locks down your server to trusted providers and IP addresses which you authorize. We would hasten to add that Incredible PBX 13-13 is still a work in progress. Changes and improvements are released almost daily. If you don’t have that pioneering spirit, then you may wish to hold off for a few more weeks until all of the kinks have been worked out. Having said that, part of the fun of participating in the open source community is rolling up your sleeves and trying out new things. Offering your suggestions as we move along almost always yields a better end product both for you and the rest of the open source community. While we don’t ordinarily recommend deployment of preview editions for production systems, it’s worth noting that both Asterisk 13 and FreePBX 13 have a lot of miles on them and are generally regarded as the production-ready platforms for serious deployments. So let’s get started. You can install Incredible PBX 13-13 Lean on a dedicated server, on a virtual machine platform such as VirtualBox, or a Cloud-based server such as Vultr. We recommend a minimum 1GB of RAM although you can get away with 512MB of RAM if you also create a swapfile. We’ve provided a script to do it for you. Depending upon the number of users your server will be supporting, we recommend a disk capacity of 10-30 GB. Last but not least, you need a reliable Internet connection. Before you can install Incredible PBX 13-13 Lean, you’ll need a basic Linux platform. For this build, you can start by deploying a minimal install of CentOS 6 or 7. The Incredible PBX installer will load all of the necessary components to support Asterisk and FreePBX as well as future Incredible PBX applications. Let’s begin by installing 64-bit CentOS 6.9 or 7 on your favorite hardware or Desktop. Or you may prefer to use a Cloud provider1 that already offers a preconfigured CentOS image. Two reasons we prefer Vultr are (1) Incredible PBX runs fine on their least costly $2.50/mo. platform and (2) for an extra 50 cents a month, you can add automatic backups to your server platform. In you’re using a Cloud platform, you can skip the rest of this section. Just choose CentOS 6 or 7 as the default operating system for your cloud-based server. Once you have CentOS up and running, log into your server as root and issue the following commands to kick off the Incredible PBX install. It’s a two-step process. First, the installer will bring your version of CentOS up to current specs and load the necessary packages to support Asterisk and FreePBX. The first stage setup takes about 10-15 minutes. When the base install finishes, your server will reboot. Simply log back in as root and run the installer a second time using an SSH terminal or Putty. You’ll be prompted whether to implement Google Voice plain text or OAuth 2 passwords. OAuth is strongly recommended. Make your selection, and the installer will work its magic. Come back in 15 minutes. WebMin is also installed and configured as part of the base install. The root password for access is the same as your Linux root password. We strongly recommend that you not use WebMin to make configuration changes to your server. You may inadvertently damage the operation of your server beyond repair. WebMin is an excellent tool to LOOK at how your server is configured. When used for that purpose, we highly recommend WebMin as a way to become familiar with your Linux configuration. Most of the configuration of your PBX will be performed using the web-based Incredible PBX GUI with its FreePBX 13 GPL modules. Use a browser pointed to the IP address of your server and choose Incredible PBX Admin. Log in as admin with the password you configured in the previous step. HINT: You can always change it if you happen to forget it. To get a basic system set up so that you can make and receive calls, you’ll need to add a VoIP trunk, create one or more extensions, set up an inbound route to send incoming calls to an extension, and set up an outbound route to send calls placed from your extension to a VoIP trunk that connects to telephones in the real world. You’ll also need a SIP phone or softphone to use as an extension on your PBX. Our previous tutorial will walk you through this setup procedure. Over the years, we’ve built a number of command line utilities including a script to preconfigure SIP trunks for more than a dozen providers in seconds. You’ll find links to all of them here. Come join the discussion on the PIAF Forum and enjoy the ride! When will we see a RasPi version of this? As a request, can you have the option of having a LEAN install version for all platforms, as well as a standard version? Some people like myself just want a basic PBX up and running without the bells and whistles.